DAKAR, Senegal - Prime Minister Stephen Harper has earmarked $500 million to a program aimed at providing vaccines for impoverished children around the world, in the hopes of spurring other rich countries to follow suit. Harper made the announcement Friday in Senegal, where he is attending this weekend's summit of la Francophonie, a network of 56 French-speaking countries. The money is part of a $3.5-billion fund the Conservatives announced last May at a summit in Toronto aimed at financing Canada's maternal, newborn and child health strategy from 2016-2020. "By ensuring that children are protected from preventable disease, we are making a vital difference in the long-term health of children around the world," Harper said at a health centre in suburban Dakar. He was accompanied by the Senegalese prime minister, Mohammed Dionne, and by Dr. Seth Berkley, chief executive of the Gavi Alliance, a global health partnership and the recipient of Friday's funding. The alliance called last May for funds so it could immunize an additional 300 million children against a variety of diseases and save an estimated five to six million young lives. Canada has already committed $325 million for the 2011-2015 funding base of the vaccine alliance, and Harper said Friday that $20 million of that will go towards giving the rotavirus vaccine to children in Central and West African francophone countries. 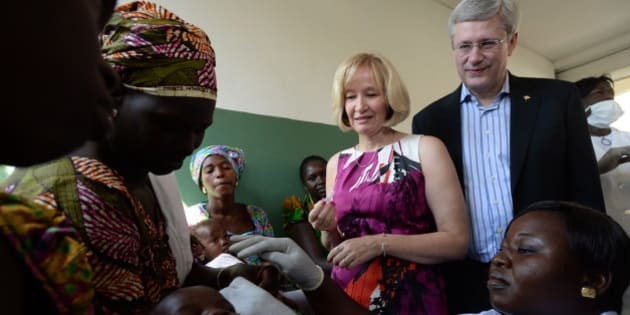 Harper also expressed Canada's support for Dionne's new Senegalese vaccination campaign against the rotavirus, which causes diarrhea and killed 450,000 children worldwide in 2008. But Harper said Gavi needs a donation replenishment if it is going to continue to be effective. "I'm confident that the vaccine alliance will meet its goals of delivering vaccines to another quarter of a billion children, thereby preventing 4 million unnecessary deaths by 2015. But the alliance is now at the stage where it needs to replenish its resources for the 2016-2020 period," Harper said. Indeed, in January, German Chancellor Angela Merkel will be hosting a G7 event with the main aim to raise $7.5 billion (U.S.) for the alliance's 2016-2020 strategy. Canada's $500-million should get the ball rolling, Harper said Friday. "I want to encourage other countries, especially our G7 friends, to follow suit," the prime minister said. Harper has made helping young mothers and newborns in developing countries his signature aid priority. Co-operating with Gavi — a partnership of private and public-sector stakeholders involved in immunization — fits well with his agenda. By narrowly targeting Canada's aid at specific problems, Harper hopes to be able to make a measurable difference in the health and welfare of mothers and children in poor countries. Harper noted that vaccinations were a key driver behind the global reduction of child deaths from 12 million to 6.6 million between 1990 and 2012. Gavi is just one of four main recipients of Canada's maternal and child health funding. "Canada's strong commitment to Gavi will save the lives of children in developing countries," Berkley said in a release. "We share Prime Minister Harper's determination to see a world free from preventable deaths and we are playing our part by working to ensure that children have access to lifesaving vaccines no matter where they live." Where In The World Is Stephen Harper?